Our firm specializes in providing a quality array of Bag Closing Thread. These Bag Closing Threads are spun using excellent quality fibers and cutting edge technology in compliance with international standards. Our offered range is tested on various parameters under the guidance of our experienced professionals. Keeping in mind the diverse requirements of our clients, we provide these yarns in different colors and shades. In addition to this, clients can avail these products in various specifications at affordable prices. Bag Closing Thread offered feature superior construction standards and find use in meeting the stitching and closing demands of HDP bags. We can offer these yarns in options of 2/8, 3/8, 3/10, 4/10, 4/12, 2/15, 4/15, 3/20, 2/30 and other options to pick from. Available in 100 % quality construction finish, these yarns perfectly match up with the demands of sewing bags used for packaging food and non-food products. 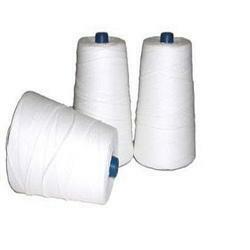 Some of its features include in compliance with defined industry standards, knot-free thread finish, use of long-staple polyester yarns for superior strength finish, choice of different cone sizes, available in 4 ply and 5 ply thickness, superior stretch-ability and others. For stitching and closing of HDP bags 2/8 , 3/8 , 2/10, 3/10, 4/10 , 2/12 , 3/12 , 4/12 , 2/15 , 3/15 , 4/15 , 2/20 , 3/20 , 2/30 100 % polyester yarn are available from a low cost yarn to a fault free yarn.